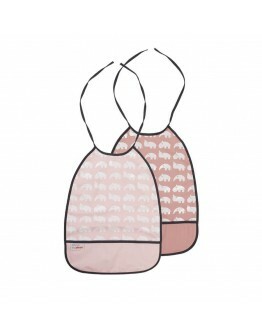 Nice original bibs for your baby and children | Grote Schatten has a nice range of trendy bibs. 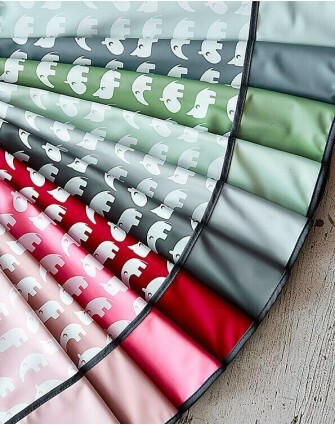 At Grote Schatten you will find for sure different bibs that you wil like! In our online shop we offer a wide choice of trendy and colorful bibs. The bibs of Grote Schatten ensure that your little one will go with lots of pleasure at the table. Let your baby spill at the table because all our bibs are easy washable. We have a range of traditional bibs, convenient, colorful and practical bibs that you can slide over the head, big, cool and sturdy bibs or even bibs with sleeves! Flashy, a soft tint or a fun print, you'll find them all here! Two convenient bibs of Done by Deer. Like this eating becomes super fun without too much spilling. 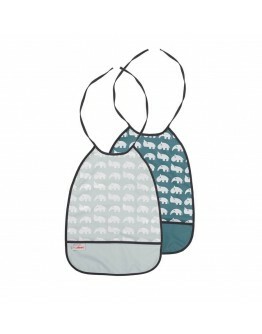 The set consists of 2 blue grey bibs with a fun animal print. Each bib is large and easy washable! Made from cotton but finished with polyurethane. These bibs are waterproof and protect the clothes. Dimensions 29 x 38 cm Phthalates-free polyurethane material Washable at 30 °C - do not tumble dry ..
Two convenient bibs of Done by Deer. Like this eating becomes super fun without too much spilling. The set consists of 2 powder pink bibs with a fun animal print. Each bib is large and easy washable! Made from cotton but finished with polyurethane. These bibs are waterproof and protect the clothes. Dimensions 29 x 38 cm Phthalates-free polyurethane material Washable at 30 °C - do not tumble dry ..